Clint Eastwood is a patriot. If his status in western cinema didn’t prove this, his many films that decorated the triumphs of the United States have. Who can blame him when he was brought up as a new wave American hero in films? Before him, there was John Wayne who could do no wrong, defeated the bad guys and had little remorse (which didn’t seen like it was necessary in his films). Eastwood entered the scene and became a new face for the newly faceted American cinema phase, which started once movies were slowly turning in favor of many audiences of any race, religion, gender and political stance. He was “The Good” when he was the man with no name, but it’s arguable how good he truly was (he was good in comparison to the other two bandits, let’s say). In Unforgiven, a film he himself directed (and his crowning achievement as a filmmaker), he played a western character veteran in a newer perspective. He wasn’t a hero by any stretch. If anything, he became the monster of the film. It’s this kind of observation that made Eastwood’s tributes to the world from his beloved home country important. He knew no one and no thing was perfect, including his homeland. American Sniper shows very few signs of this depth. It restrains from being too dimensional, especially when dealing with such a controversial figure. In Unforgiven, William Munny was clearly evil, but the movie still carried on to try and conclude with him as the hero. The movie refused to pretend he was good; It just wanted to end before we saw even more of the truth. This self awareness is marginally present in American Sniper, where it would have been more than welcome. Chris Kyle is a different person depending on who you talk to, but to most he was still someone with a lot of blood on his hands. Even supporters of him and his efforts for his country can admit that there is something dark about this triumph. Then there are those who are strictly opposed to his achievements, especially when they link possible racism as a major factor for his high kill count. Either way, there is a lot of debate as to who Kyle truly was, and very little of this gets addressed. We see one person thank Kyle for his service outside of war and one person disregard him as a person. I don’t believe the movie paints him out to be a perfect American hero (only through the eyes of his supportive wife Taya, though), but it could have done a better job at showing how complicated his legacy got. Not everyone would be willing to call him a “legend”. With a tag line that calls this movie a biopic about “the deadliest sniper” in American history, there is a word used that should never be used lightly. If he was the “deadliest” and not the most “successful”, more of his actual repercussions should be shown if that’s what the movie is trying to (and should be trying to) convey. While it tried (minimally) to not make Kyle simply a flawless hero, American Sniper barely tries to not be black and white, which may be the reason why it was harder to see the different sides of Kyle’s status. There is almost zero effort in making the Iraqi people seem like civilized citizens. Of course there are people in Iraq that are opposite to Kyle’s character, but that does not mean that almost everyone in Iraq is shady, barbaric or crazy. There was one instance (count it, one) where people from Iraq where seen as normal and worthy of your sympathy, but nothing outside of this. They are either straight up evil or they are tricksters that will make you think lowly of them. The main bad guy Mustafa never speaks and is made out to be some kind of cloaked video game boss who seems invincible. You see him spinning a bullet on his table, as he is waiting with his rifle at one point. It is as if all he has ever done is sat with a weapon. This man is not a real person. Since this feels like Eastwood’s take on a Kathryn Bigelow movie, it only feels necessary to bring some comparisons between the two to see where American Sniper could have excelled, especially since it had the capabilities to. If you look at a movie like The Hurt Locker, where Jeremy Renner’s character is clearly not all there mentally, so much fear is placed on whether or not the squad is safe from their own team mate. Not everyone outside of being an American citizen here is bad, and even Renner’s character is seen as bad when he falsely attacks some innocent Iraqi civilians though out the film. Zero Dark Thirty weighed a lot of guilt on its main character Maya, as if many of the film’s misfortunes happen through her stubbornness on wanting to find Osama Bin Laden. In both of these films, Americans are seen as undeniably flawed, but we still have to pick a side out of the two. Each side is full of monsters and full of the casualties who did not deserve to get wrapped up in this. With American Sniper, a movie based on such a debated figure like Kyle, there could have easily been this kind of argument. Instead, we are left wondering much less than this. Outside of these political issues, American Sniper is far from the worst movie, and it is probably Eastwood’s best achievement in a few years (keep in mind, that isn’t saying too much). His direction is deserved of attention, as he easily matches the many directors, arguably influenced by his own work, that have followed him. He does this in his mid 80’s, and that is something we simply cannot ignore. He pulls off some impressively orchestrated moments, especially the ones that take place mid battle. There is one thing he managed to somewhat replicate from a Bigelow film, and that is the strength tension can play within the war zone. While you won’t feel nearly as much anxiety within American Sniper, you still manage to be intimidated even if you try your hardest to fight against the movie. A lot of this is also thanks to Bradley Cooper’s terrific performance as Kyle. With a role that Cooper will possibly find a hard time to top, this Kyle lite character is at least easy to sympathize with (even with a horrifically small blueprint that does not build the entire structure). Cooper saves this role with absolute ease, and a weak lead would have made all of the things wrong with American Sniper all the more appalling (even with Eastwood’s tear jerking direction). You can slowly see the empathy Kyle has for anything fade from behind Cooper’s eyes, and Cooper makes it as though Kyle had started to disappear even before the war even started. With the lessons he was taught as a child, Cooper’s Kyle was always stricken by the evils of life. 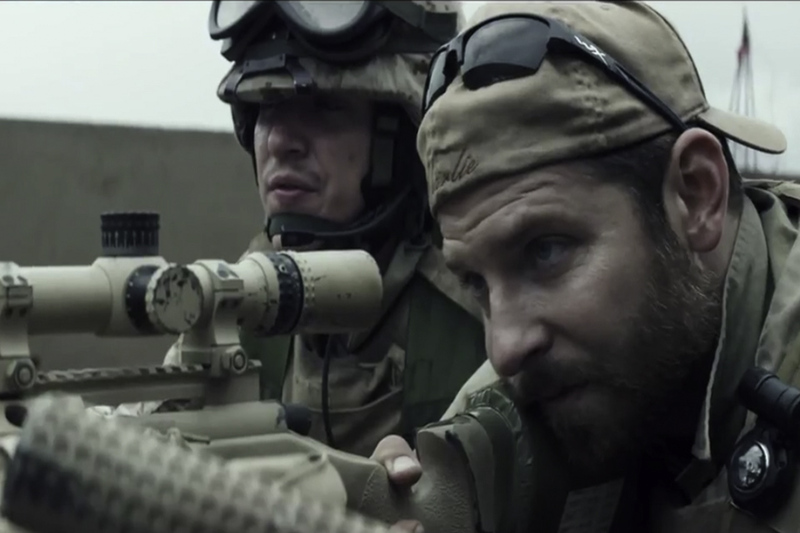 In terms of how it was put together, American Sniper is quite spectacular. It is shot and edited with such finesse. Everything on screen feels quite real, with Eastwood and Cooper as the two captains that led everyone into the middle of the fight. It is such a shame that the film falls face first onto the dusty roads it wishes to march on when it comes to being fully realized outside of a cinematic spectacle. There is no depth between the heros and villains (sadly, what else can they be called here?) and there is very little that shows the kind of echoing side effects of war that Eastwood has publicly defended his movie with (how much of American Sniper shows the downside of Kyle’s war traumas?). There is a borderline disgusting link between the September 11th attacks and Kyle’s work in the Iraq war which could have easily been saved had Kyle said something along these lines: “First the world trade center and now this? I need to do my part when I go to Iraq”. Instead, it is almost as if September 11th is the reason why Kyle went to Iraq, and it’s difficult to trust a movie’s portrayal on such a figure when it slithers its way through American events as though they are all linked. The ending is shoddily rushed as well, as if it jumped ship before it got a chance to truly see the bigger picture of Kyle, his reputation and his post war mental stresses. Even with all of its flaws, American Sniper is still worthy of a watch for those interested simply because of Eastwood’s leadership, Cooper’s film-saving performance and the smoothness of the film’s technical aspects. As a story, it is alright at first but it only suffers the more you realize how harmful and self detrimental it is. Clint Eastwood has shown an imperfect America many times before, especially while still admitting his attachment to his birthplace. It almost feels as though he was either pressured into making American Sniper one of his more basically defined films or that he was too worried that more people would be offended that an American figure was seen as a problematic person than they would have been with this final result. In the film, Kyle is advised to aim for someone’s shirt button and not their shirt. If you aim for the shirt, you can miss the shirt and miss the person entirely. If you aim for the button, you will still hit the shirt when you miss and thus hit the person. American Sniper clearly aimed for the button at first, got aware of its possible aftermaths, and began to zoom out and aim for the shirt. It takes many risks under a very safe blanket. It is great in some aspects, but very flawed in many of the areas where it truly counts. I still recommend the film, but only with the warning that there are basic film fundamentals and moral issues here that are suffering.